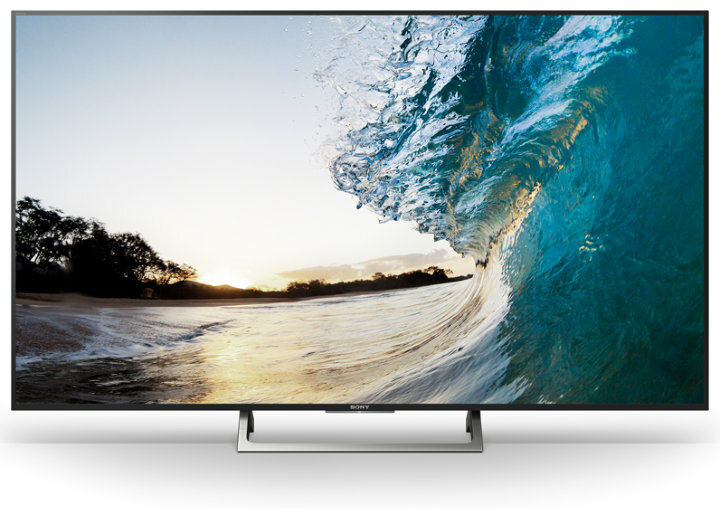 In a nutshell: The Sony KD-55XE8596 is a mid-range 55-inch TV with 4K HDR support. The slim aluminium frame and silver slate stand with neat cable management are attractive, and the TV comes with the benefit of Android Smart TV too. Picture quality isn't a match for Sony's more expensive models, and we feel the price ought to be lower to reflect that. The Sony Bravia KD-55XE85 range looks similar to Sony's more expensive TVs of 2017, like the XE90 and XE93. The aluminium frame surrounding the screen is narrow, and is complemented by an attractive silver slate stand. Cables are concealed within the stand for a neat solution to all those trailing cables you usually find coming out of the back of your TV. Our only complaint is that the stand feels quite flimsy and the screen wobbles if you push it. The XE85 sits in the lower half of Sony's 2017 range, and can't meet the high picture quality of its more expensive siblings. It's an edgelit TV, rather than the direct backlit XE90, with frame dimming instead of local dimming, and the result of this is that while the screen performs well for general viewing, the contrast levels aren't as high as we'd like. When compared directly against the outstanding XE90, images on the XE85 can look grey, and there isn't as much shadow detail. Still, it's not all bad. The Triluminos display is bright and colourful. The XE85 uses the same X1 4K processor as the XE90, and does a superb job of upscaling video from non-UHD sources. It's HDR-compatible too, although the benefits of HDR aren't as obvious on this screen as on the more expensive models. In fact, if you're expecting this to perform like a high-end HDR screen, you'll be disappointed. Motion performance is good, with a native refresh rate of 100Hz, and Sony's MotionFlow 1000Hz giving smooth movement. The TV is good for gamers too, with a low input lag. Viewing angles are good for a LCD screen too, which means that you can sit off-centre and the colours and contrast will remain fairly good. Audio quality from the XE85 is average for a mid-range TV. The bass reflex speakers produce a total of 10W plus 10W power output, and are sufficient for everyday programmes. You'll benefit from adding an additional soundbar if you enjoy sport or films. Sony switched its Smart TV system to Android TV back in 2015 and has stuck with that decision, attempting to iron out the initial bugs and teething problems. Two years on, Android TV runs much more smoothly, and we're hoping that the system will prove to be robust in its latest incarnation. Android TV still isn't as friendly as rival systems, but it does offer plenty of choice, via Google Play apps. Netflix, Amazon Instant Video and YouTube are available for streaming content, and you can easily access a full range of catch-up TV services too - BBC iPlayer, ITV Player, All 4, and My5. Android also provides features such as Google Cast, which lets you mirror content such as videos or photos from an Android phone. The TV SideView app lets you use your Android phone or tablet to control the TV. Connectivity is good. There are 4 HDMI connections, all with HDCP2.2 support, plus 3 USB ports, component and composite inputs. ARC support and a digital audio output let you connect up a home cinema system, and you can also plug in a subwoofer to the headphone jack. The TV supports Wi-Fi and ethernet networking, Bluetooth connectivity, and also has digital satellite and terrestrial tuners. The Sony KD-55XE8596 is a mid-range offering, and is therefore neither the best nor the cheapest TV from Sony this year. We think it ought to be quite a bit cheaper than its £1,400 asking price. Look for a reduction in price to £1,000 as Christmas 2017 grows near.